Here are 7 Reasons Why a Block Basement is a Better Basement! The top plane in block basements will be level at the sill plate. Poured concrete walls tend to settle within their forms causing an uneven finish at the top. Block basements add flexibility because they can be fitted around any shape of door and window. With concrete masonry units, you are not limited to the size of forms, as in poured concrete walls. Concrete masonry walls are installed dry. Poured walls remain damp and wet for some time after installation. 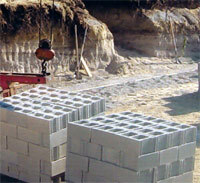 With block walls, the quality of concrete masonry units is controlled by the manufacturer. With poured walls, quality can be influenced by the contractor increasing the amount of water (thus decreasing the concrete strength) and by a number of other environmental factors. A basement made with concrete masonry units is less likely to crack than a poured concrete basement because when poured in forms, the concrete will shrink as it dries in natural environmental conditions. The warmer it is during drying, the worse the cracking will be. Accommodate almost any shape or size including circles. © 2019 ML Moore & Associates, Inc.